Are you looking to expand your family entertainment business? You need to consider marketing to Fairs and Festivals! 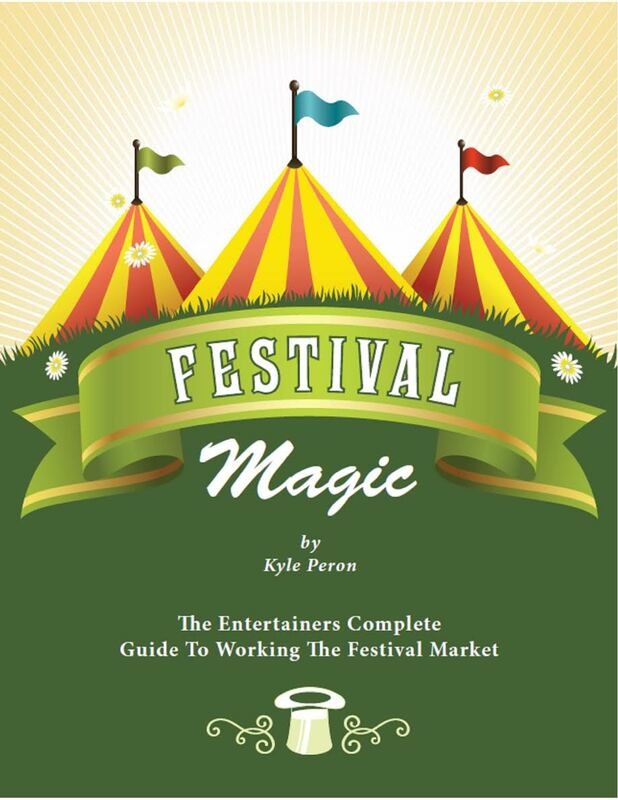 Philadelphia magician Kyle Peron tells you how in his 110-page downloadable eBook, jammed full of the most relevant information on how to book and how to work this lucrative market – a market that can generate substantial income for you year round. If you are already performing for children and their families -- even if you are a strolling magician working family restaurants -- then festivals are a perfect extension of what you are already doing. You can learn to perform at these larger scale events by simply modifying your current show and knowing how to market it effectively. These are just two of the strategies that Kyle gives to you in Festival Magic. This eBook gives you a background of fair and festival market and shares the qualities that Festival bookers are looking for when they hire an entertainer. It shows you step-by-step techniques to market to festivals, to land the gigs and to perform successfully so you get rebooked. Along with great advice, tips and strategies, Kyle reprints his complete lead generation letter, follow-up letters and full templates that he has used for years to handle all aspects of communication and marketing with fair and festival bookers. These alone are worth the price of the book. If you are a full-time or part-time pro who wants to learn how to get fairs and festival bookings, take your magic business to a new level by implementing the advice of a working pro. He’ll help put you on the fast track by teaching you how to make your act an entertainment solution that fairs and festivals want to book. Buy this now and you'll be able to download it today, so you can get started learning about how to book and perform at Fairs and Festivals near you.